After being without my wireless card for 4 days (I abandoned it in the back of a mini-van after a long car trip back from Fort Wayne on Friday after watching a deserving woman win a year's worth of free groceries from Indiana farmers! ), I was quite surprised to find out that I got my first blogging award! My gal pal over at Going Jane presented me with the Versatile Blogger award. "Less than 3" you, Janey-Jane. Pass the award on to 15 bloggers who you have recently discovered and who you think are fantastic. Contact the bloggers you've picked at let them know about the award. Thanks my friend, Going Jane. I laughed OUT LOUD when I read the line in your Bathtub Mama post. My grandma passed away on Friday. She was 94 years, 352 days old and I miss her already. She and my grandpa showed me and my sisters unconditional love every day of our lives. We were the smartest, most beautiful, most talented babies, girls, young women and women in their eyes. I know she's in heaven with my grandpa right now in the middle of a wicked Euchre game with their friends! I just ate a half bag of cotton candy and it was delicious! I'm addicted to peppermint mochas from Starbucks. With my rewards card, I get free syrup and use it as an excuse to get one daily b/c look at all the money I'm saving! I work with farmers every day and feel truly blessed that I can combine my two loves - communications & agriculture - in my career. I have the world's cutest, smartest, funniest nephews. I never knew I could love 4 boys so much. I have been having trouble sleeping lately and am depending a little too much on Tylenol PM (but they are magic little pills). I recently got DIRECTV and am a little in love with my DVR. Going Jane: I have always said that her life is perfect for sharing. 1) She inherited her dad's way of spinning a tale; 2) With a husband, 3 kids, sheep, horses, and a job, there is always a great story to tell; and 3) She has a wicked sense of humor. 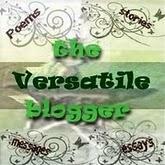 Go to her blog today and be prepared to laugh out loud and learn something new! Goodeness Gracious: She is one of the first people I know personally to start blogging. She has a great conversational writing style and her photography is wonderful! Frugalista Farm Life: I'm biased because this chick is my little sister (Brat, as I affectionately call her) but she does a great job in sharing bits and pieces of her life, as well as recipes, shopping tips and crafty ideas! Trippin' - Life with Triplets: The mother of four (a daughter and triplet boys) - need I say more? Bathtub Mama: This gal is my reading buddy, my I just need to talk to someone who understands friend. She's just getting started but I know her blog could be something special! In Good Cents: When I started getting serious about couponing and finding the best deals at my favorite stores, I stumbled across this blog. She breaks down the deals by store and has links to printable coupons! Off the Cuff and INDYpendent: To be 20-something again! This blog lets me pretend that I am that young again. She is a wonderful writer and her enthusiasm for life is second to none. Beyer Beware: The header on this blog says it all without saying a word. The Pioneer Woman: This woman needs NO award from me but she is truly the first blog I started reading on a regular basis - definitely the first blog of someone I did NOT know personally. Her way of writing is engaging, entertaining and keeps you coming back for more. And someday I'm going to win a darn mixer from her! All tenderloins, all the time: OK, I just stumbled upon this one recently while I was on the visitindy.com site and the name says it all. While I'm a grilled tenderloin fan myself, this blog is a wealth of information! One Man's Indy: I give props to a man willing to step up and do some blogging. Better yet he's giving insights about Indianapolis - a city that I love but don't take advantage of enough! Winners Drink Milk! : I grew up drinking a glass of milk at breakfast and another one at supper (that's what we call our evening meal) and to this day there's nothing better than a cold glass of milk and a plate of warm cookies! This blog has great information as well as recipes featuring...wait for it...dairy products. Cheese is one of my favorite foods, right up there with chocolate and bacon! Two Maids a Milking: Staying with the dairy theme, these gals are a hoot. They are also doing some great things on their dairy farm - like opening it up to the public so children and adults can have a better understanding what a farm looks like today. PassiveAgressiveNotes.com: We all have those days when really nothing is going right and we need a pick-me-up. Next time you have one of those, visit this site. It's guaranteed to make you shake your head, laugh out loud or say "I've seen a note like that one!" FenceRow to FenceRow: I've always thought this lady has the BEST JOB EVER, but when I read her post "16 and Pregnant" I had a tear in my eye and a new respect for her. Boy, that was harder than I thought it would be. I hope you enjoy learning a little more about me and enjoy the blogs above as much as I have. Now that my sugar buzz from the cotton candy has worn off, I think I'll be able to sleep without the Tylenol PM tonight! YOU are a ROCK STAR!! lol! <3 ya! Hi Megan.. I came to you from Jane's blog. Congrats on the award. Sorry about your grandma ~ Grandmother's are amazing .. there is not a day that goes by that I do not think of and miss mine. Thanks for the award Megan. I am so sorry to hear about your grandma. HUGS! BTW-- I am totally addicted to my DVR too! A Coke + A Crockpot = Delicious! Where There's Fire, There's S'mores! Just call me Miss Fix-It! I'm messy, not a hoarder!